Their eggs are considered delicacies and their waste has been described as "brown gold for your garden" by Allen Easterly of Backwoods Home Magazine. 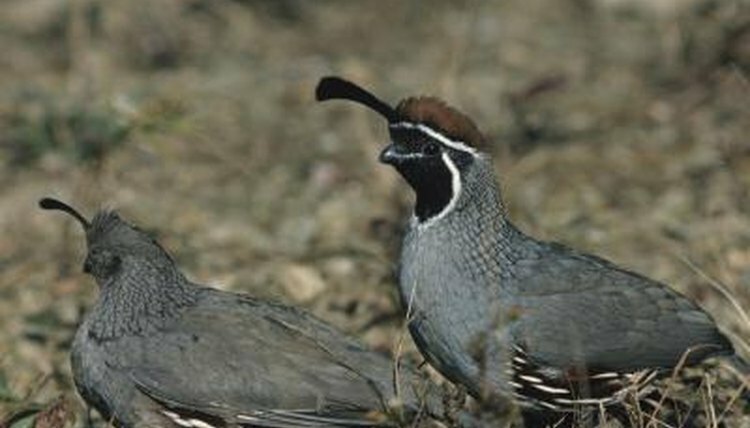 If you'd like to raise a few quail, you don't have to start out with a covey as large as 100. Even with only 10 quail, you'll need adequate housing. A quail barn is the solution you're looking for to keep your little birds out of the weather and protected from predators. When you hear "barn" you probably have visions of a massive structure that is large enough to house horses and cows. But a quail barn is scaled-down to the little birds' size. Being only 8 to 11 inches, your quail will need a barn that is 1 to 2 feet high. As for the amount of space you'll need inside the barn, about 1 square foot per bird is sufficient. If you intend to include an enclosed outdoor run, make it as large as you have room for. You can get everything to build a quail barn at the local hardware store. Of course you'll need the right tools such as a tape measure, staple gun, saw, hammer and paintbrush. Pine two-by-fours, nails and paint or stain to protect the outside of the barn are the basic essentials. You'll also need some 1/2-by-1/2-inch hardware cloth for the floor and to enclose the outside yard area of your barn, if you intend to include one. If you have a yard with space for your quail barn, you can build a ranch-style spread, with one or two barns large enough for your entire covey. If you live in the city and are short on space, your quail will adjust to urban living easily. You can construct a quail high-rise by stacking two or more barns atop each other to provide enough space for however many quail you want to keep. Installing slide-out trays below the hardware cloth floors of each level makes for easy cleaning. Also, mounting the food and water dishes on the outside of the barns with openings for access will free up space inside the barns and reduce the chances of your birds spilling and contaminating them. Your quail don't need perches such as chickens use, but they would appreciate an alternative to the hardware cloth flooring. It is big enough to support their feet, but your little birds need a break from it now and then. Provide a platform, either raised or simply use a piece of plywood to make part of the floor. A different option would be to place a sandbox inside of your quail barn. The texture will be a treat for their tootsies and the quail will eat some of the sand to keep their digestive systems in working order.